Our dogs love to be with us, so when we leave the house and see our dog’s sad eyes and drooping tail we carry the guilt until we are reunited again. For some dogs, this is more than just missing us. 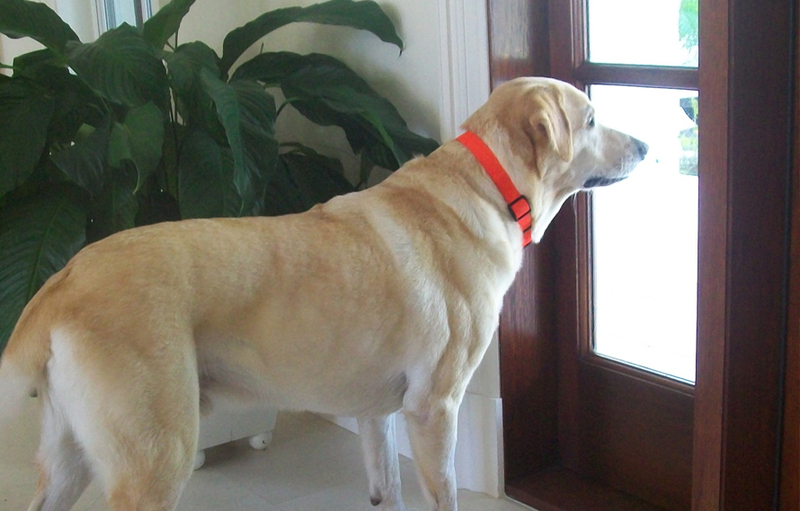 Separation anxiety can stress the dog until he pants excessively, paces, barks, or claws at the doorway. Chewed sofa cushions and worse may await us when we return. There are many steps to take to help your dog relax when you aren’t home. Start with the way you greet the dog after an absence. It is tempting to drop to the floor and let your dog cover your face with kisses, but this actually feeds the drama. Easy-going greetings and good-byes help the dog understand that coming and going is no big deal. A pacifier can help, too. Stuff a durable, hollow toy with a few treats, some of the dog’s dry food, and a little peanut butter or cream cheese. Give this to your dog just before you walk out the door. Part of the solution may be a new containment option. Metal crates can be loud and claustrophobic, but you need to protect your furniture and rugs from destruction caused by an anxious dog, so what do you do? 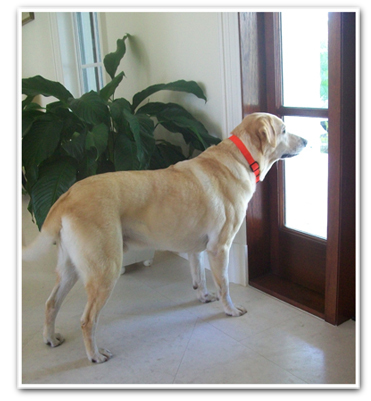 Dogs suffering from Separation Anxiety can benefit from a containment system that offers space and security. The Freestanding Pet Gates and the Convertible Elite Pet Gate from Richell USA allow owners to limit the dog’s access to certain rooms, but still have a nice, spacious environment he can inhabit safely. The Freestanding Pet Gates have sturdy feet with rubber tips to discourage sliding or pushing at the gate. The Convertible Elite Pet Gate allows owners to transition dogs from a spacious pen configuration to a gate or even a room divider once the dog can handle the extra freedom. The variety of height and width options help owners find a perfect fit and the designer look of the gates mean they complement the living areas of your home, right where the dog wants to be. Some dogs will get stressed well before you leave the house, because they are reacting to the signs, or triggers, which indicate you are heading out. Practice showing the dog these triggers, such as picking up car keys and sunglasses, but instead of walking out the door, just reverse your steps and replace the keys and glasses right back where they were. Do this several times a day, working up to going to the door and then leaving the house for just a minute before coming back. Most dogs afflicted with Separation Anxiety will react less to the triggers with this type of consistent desensitization. Studies have shown that the dog’s stress levels peak during the first thirty to sixty minutes of being alone. Taking the dog for a nice long leash walk before you go works wonders to help him chill out. Walking allows him to take in the day through all of his senses, processing new smells, sounds and sights that satisfy him mentally and physically. Then spend a few minutes in the gated area with the dog before you leave. Keep your own stress level low and your good-bye casual, and your dog should take your cue.